First Light Technologies, Inc. is pleased to announce the availability of compatible and economical replacement lamps for the TrojanUVMax™* units. Simply unplug the old lamp and clip in the replacement lamp. Physically and functionally equivalent to the Trojan replacement lamp. This replacement alternative is manufactured in the USA by First Light Technologies, Inc.
An excellent alternative to the higher priced Trojan lamp. * TrojanUVMax™ is a registered trademark of Trojan Technologies. 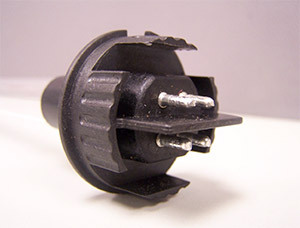 Trojan Technologies has not sponsored, endorsed or approved this or any other First Light Technologies, Inc. replacement lamp.